Parents are trying to raise healthy kids and we need health organizations to be our allies instead of selling us out. That was the point I tried to make when New York Times reporter Stephanie Strom recently interviewed me for her article about the new “Kids Eat Right” label, from the Academy of Nutrition and Dietetics (AND), which represents registered dietitians and other nutrition professionals. When Strom told me that Kraft Singles was the first product AND picked to get the label, I was shocked. The first thing that came to mind was the chapter on the “Pasteurized Prepared Cheese Product” from Melanie Warner’s 2013 book “Pandora’s Lunchbox.” She wrote about its “rubbery texture and Day-Glo sheen” inspiring me and many other mothers to shift our grocery carts away from Kraft’s highly processed products. Last month the Washington Post ran a story with the headline “Your healthy habits are eating into the packaged foods industry” about how Kraft’s sales have been tumbling. I have no doubt that Kraft is looking for AND and its new label to provide some desperately needed healthwashing in order to turn things around. AND touts that it is committed to improving the nation’s health, so one would expect it to put the public’s needs ahead of the food industry’s profits. Kraft paid AND an undisclosed amount for the new logo placement, yet AND claims the new label is not an endorsement. 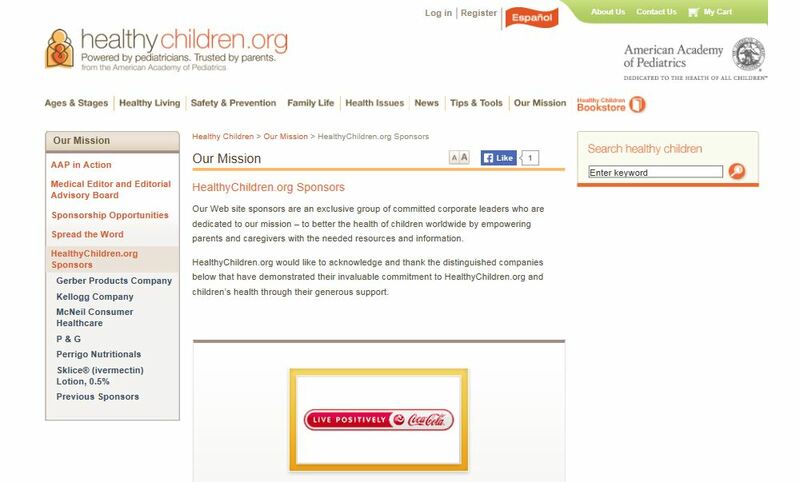 Rather, it says it’s an ad for AND’s “Kids Eat Right” on Kraft Singles, paid for by Kraft. While AND is busy helping their industry partners boost sales, they are silent on issues that would significantly impact public health, like ending the marketing of junk food to children. Two years ago I wrote about the problems of AND being sponsored by companies like Coca-Cola and Pepsi. 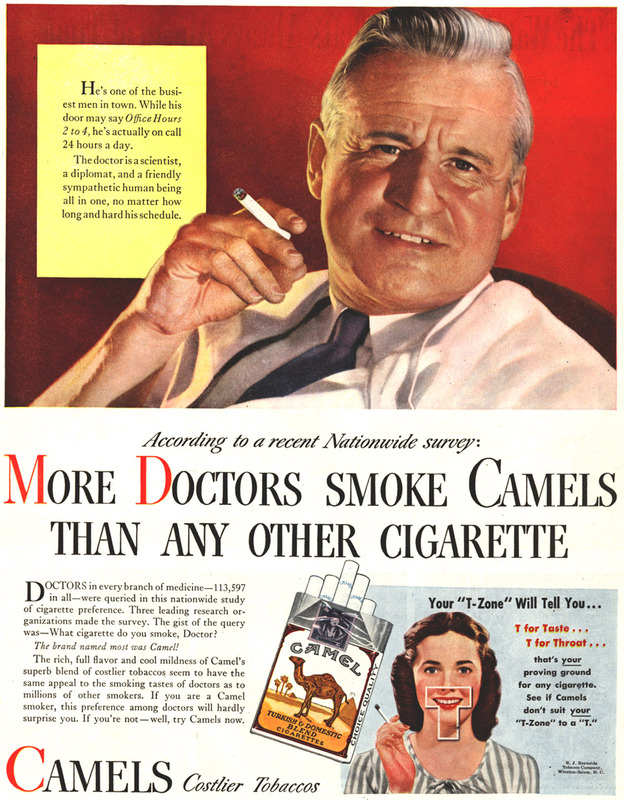 I compared it to the conflict of interest that existed when doctors would line up to get free cigarettes from tobacco companies at the American Medical Association (AMA) conventions in the 1940’s. This kind of industry influence was one of the reasons the AMA did not publicly acknowledge the harms of cigarette smoking until 1978. Instead of seriously addressing the concerns over industry ties, the new label is a sign that AND is moving even deeper into Big Food’s pockets. This latest failure by AND was especially galling since it came on the heels of news about the “sugar papers.” These are documents showing the major role the sugar industry played in undermining dental public health policies in the 1970’s by influencing officials at the National Institute of Dental Research. It’s especially disappointing considering rates of type 2 diabetes and nonalcoholic fatty liver disease in children have increased significantly since then. If those experts had chosen to speak up for us instead of siding with the sugar industry, think of how much suffering could have been avoided. Advocate Nancy Huehnergarth wrote an open letter in 2013 to the Presidents of AND and the American Academy of Pediatrics (AAP) asking “When Will You Stop Taking Money From Junk Food Peddlers?” It’s 2015 and we’re still waiting. Many of today’s parents weren’t even born when the 1970’s experts dropped the ball and let the sugar industry shape policy. This impacted not only our health but the health of our children. Fortunately, some of today’s experts are speaking out to avoid history repeating itself. 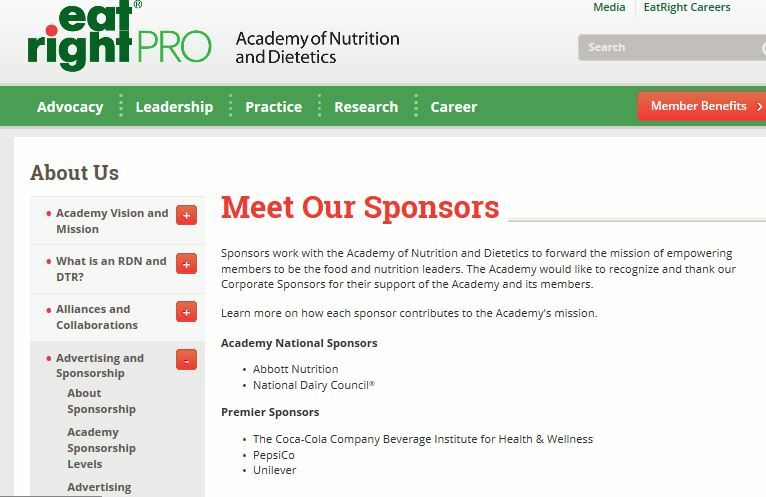 Dietitians for Professional Integrity was organized to advocate for ethical sponsorships within the AND and change the current corporate sponsorship model to prevent their professional integrity from being compromised. Members of the School Nutrition Association who disagree with their leadership have signed a letter opposing any weakening or waiving of school nutrition standards. Physicians Against Unhealthy Corporate Influence was organized to amplify the voices of doctors and other healthcare providers as they speak out against these conflicts of interest. Parents need more of these experts to speak up and for them to get much louder in order to be heard over the call of corporate cash. How’s that for helping to prove my point? Tags: Academy Nutrition and Dietetics, American Academy of Pediatrics, School Nutrition Association. Bookmark the permalink. Thank you! I just read the NYT article and got so angry about it that I sent messages (via LinkedIn) to three of the people quoted in the article, imploring them to take an honest look at their work. Two from Kraft and one from the Academy. I honestly do not know how they can sleep at night knowing their work is spreading illness to millions.